Here is the best of what is on offer in and around Cusco, take advantage of our full Day and Half Day tours. 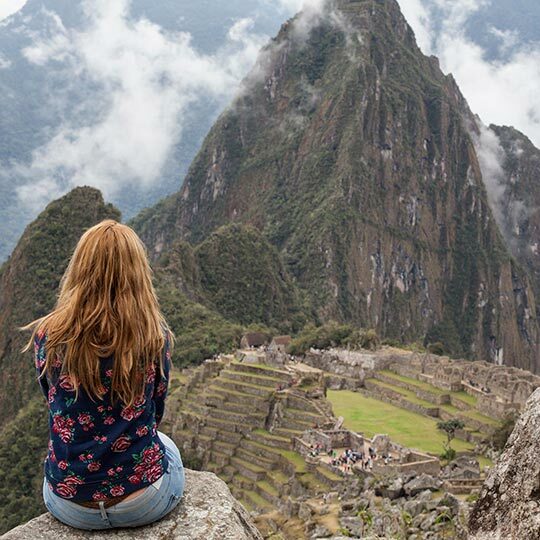 From the Sacred Valley of the Incas where you will encounter magnificent Inca ruins and temples, beautiful terraced mountains and shop in wonderful Indian Markets. 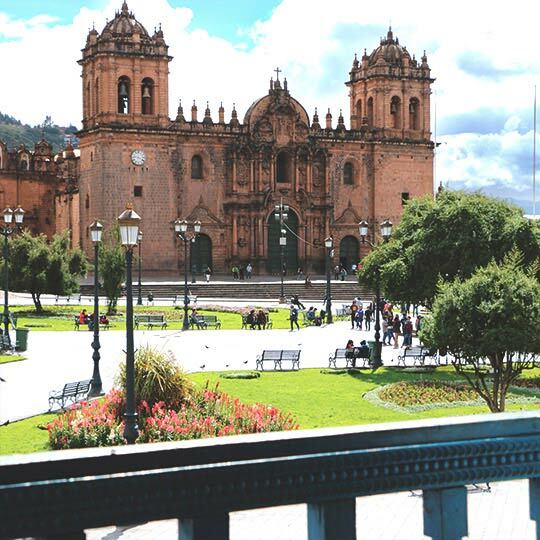 Half day City tour of Cusco, see the wonderful Catholic churches one of which is built on top of an Inca ruin, take in the ruins at the top of Cusco with the most spectacular view you may ever see. Why not take a tour to Moras Moray where you can see the interesting salt mines the local people still work today. Or a half day tour to the south of Cusco to the town of Andahuaylillas where you will visit the charming church Capilla Sixtina. 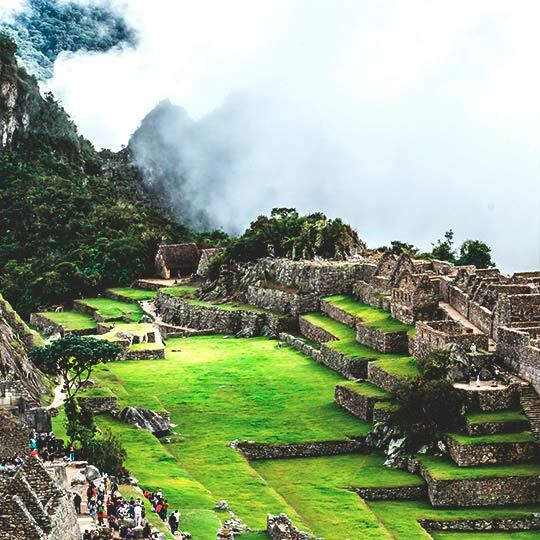 Also we can´t forget to mention a day trip the unforgettable Inca city of Machu Picchu set high on the mountain a trip to Peru is not complete without a visit to Machu Picchu. 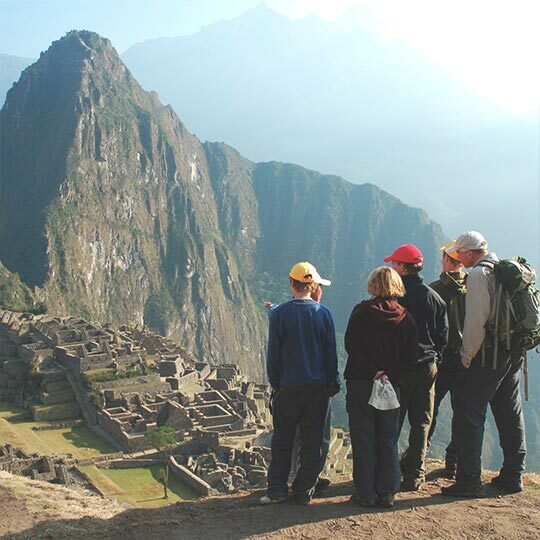 Ask a Machu Travel Peru representative for more information. NOTE: This tour’s starting point is in the “Plaza de Armas” or Main Square. If you would like to be picked up from your hotel, contact us to make the arrangements. Today is THE DAY! Very early in the morning, our transfer and private transport will meet you at the lobby of your hotel in Cusco and take you to the train station. There, you will take a spectacular and scenic 3 and a half hour journey to Aguas Calientes / Machu Picchu. Once you arrive back to Cusco, our private transport will take you back to your Hotel. Private transportation from your hotel to the train station and back. Round trip expedition train tickets to Aguas Calientes. Round trip bus tickets to Machu Picchu. Write to info@machutravelperu.org for more personalized attention, the tour price may vary depending on the group number. NOTE: This tour starting point is in the “Plaza de Armas” or Main Square. If you would like to be picked up from your hotel, contact us to make the arrangements. A few minutes before 08:30 hrs, your private guide and driver will pick you up from your hotel to start your city tour. Our first visit will be to the Main Cathedral, built between 1560 and 1664. This building boasts numerous chapels in its interior which are richly embellished with baroque motifs. 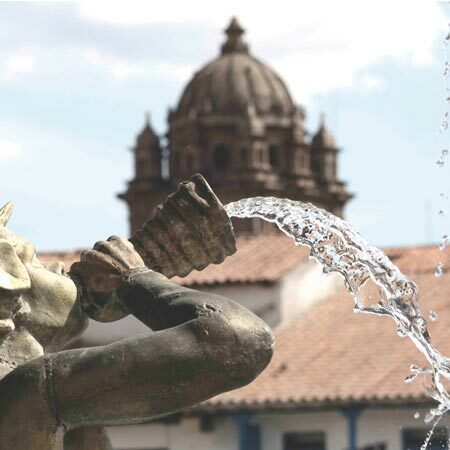 In addition, there are numerous valuable sculptures and paintings belonging to the “Escuela Cusqueña” style – (the Cusco colonial style of painting). Then, we will continue our tour to the Qoricancha Temple of the Sun, a majestic place that, in Incan times, was devoted to the worship of the sun. The temple is also currently the Santo Domingo Convent, founded in 1534 as the first Dominican convent in Peru. This building, a true masterpiece of architecture, wonderfully combines both Incan and colonial heritage. We will then go to the surrounding area of Cusco to have an interesting guided tour in Sacsayhuaman, an imposing fortress that was built with blocks of stone that, in some cases, weigh over 120 tons. Then, we will go to Qenqo (labyrinth), an important archaeological center used as a sanctuary in the Incan times. 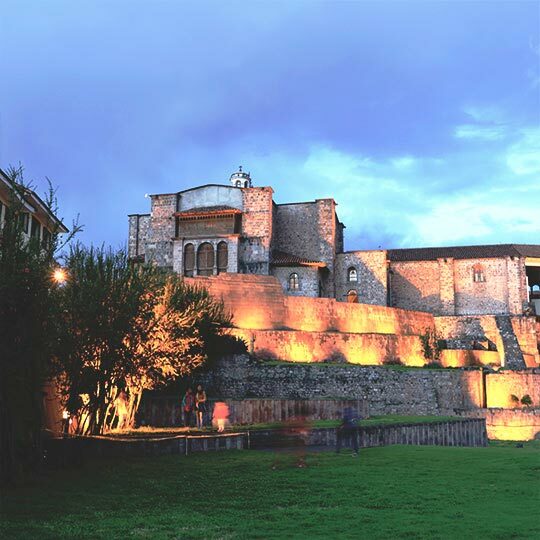 Our next destination will be Pucapucara, a military construction composed of large walls, terraces and staircases and which was part of Cusco´s last defensive line. Finally, we will visit Tambomachay (resting place), an archaeological site that was dedicated to the worship of water and was a resting place for the Incan Empire’s sovereigns. Upon the conclusion of your tour, you will be taken back to your hotel. Today, your private guide and driver will collect you from the lobby of your hotel between 8:15 and 8:30 hrs, and lead you into the Sacred Valley. Your first stop will be Awanakancha Living Museum and Textile Workshop, where you will witness how our ancestors used to elaborate their clothes using the antique techniques of tainting and weaving. You will also have the opportunity to taste the different delicious varieties of Andean potatoes and corn. We will then continue through the valley to visit the Pisaq Archaeological Site which boasts an impressive Incan complex located on the top of an important mountain in the Sacred Valley. Then, you will return to the town of Pisaq, which has a large daily market full of produce for both tourists and locals. Villagers from the mountains come to this market to sell their home-grown products and unique handmade arts and crafts. It is highly regarded for having a wide variety of interesting souvenirs at great prices. Continuing your tour through the Sacred Valley, you will go towards Urubamba, passing through gorgeous towns and amazing landscapes. You will then stop for a delicious local lunch, lovingly prepared with local ingredients, before continuing on to Ollantaytambo. Here, you will have the chance to visit a local family and see how Incan descendants live their everyday lives. Then, you will visit an impressive Incan fortress perched on the mountainside and stand where the last great Incan emperor stood on horseback during a pivotal battle with the Spaniards. Upon the conclusion of your tour, you will visit Chinchero, a well-known town because of its colorful native clothing. Finishing this tour, you will return to Cusco and be dropped at your hotel or at the main square where you can have dinner in one of the many restaurants. A few minutes before 08:30 hrs, our private guide and driver will meet you in the lobby of your hotel to go to the town of Maras. This is where you will start your amazing tour which is a scenic journey through little towns and beautiful Andean landscapes. First, you will visit the town of Maras, from which you can admire the nearby Andes Mountains and some of their snowy peaks, such as "El Chicon" and "Veronica". Then, you will visit the Moray Archeological Complex, located 7 kilometers southwest of Maras. This complex boasts a set of enormous circular terraces that rise around a giant pit. These beautiful terraces were designed as an agricultural experiment and have been described as a "Greenhouse Prototype." Finally, we will visit the salt pans, located northwest of the town of Maras. Here, you will find around 2000 small wells that local people still use to provide themselves with salt today. After our visit, our private transport will take you back to your hotel in Cusco for about 13:30 hrs. This morning, after breakfast at your hotel, your private guide and driver will pick you up from your hotel in order to go to the Tipon Archeological Complex which is located 27 kilometers from Cusco City. This site boasts a great number of terraces and intact water channels which have been described as “a marvel of hydraulic engineering”. This complex contains an irrigation channel which is considered one of the greatest masterpieces of irrigation of Incan times with outdoor water ducts. Part of this site is also crossed by the Inca Trail. After this tour, you will continue to the Pikillacta complex which was built by a Pre-Incan civilization and which was later used by the Incas as a military fortress. Following this tour, you will visit Andahuaylillas, a small town where a colonial chapel named “Capilla Sixtina” is located. Among its inner beauties, this chapel has the famous “one wood-pieced pulpit”, a masterpiece that took 4 years to build. When you finish this tour, you will be taken back to Cusco to be dropped at your hotel.